This chart shows the all-important annual growth rate in credit for “Owner-occupied” and “Investor” housing, for the period July 1992 to March 2013. As we saw in January’s very popular “The Easy Way To Know Where House Prices Will Go”, anyone can visit the RBA’s website and use their monthly updated Chart Pack to see the true reason why house prices rose so strongly for over twenty years. It was all about the annual growth rate in “credit” for Housing, which is presently five (5) times lower than the peak seen in February 2004. … and that is where a closer examination of that one chart above demonstrates that the RBA’s house price policy — trying to pump up the housing bubble again, now that their recently preferred “make room for the mining boom” policy has proven to be seriously short-sighted — is doomed to failure. Take careful note of the change in the growth rate of housing “credit” for “Investors”, as compared to “Owner-occupiers”, as interest rates moved. As you can see, the three (3) interest rate increases in late 2007 through early 2008 tipped both “Investor” and “Owner-occupied” housing credit growth over the cliff. By October 2008, when the RBA began taking a chainsaw to interest rates, housing credit growth was practically in free fall, plummeting from 12% per annum (Total) to 6.3% per annum, before the total 4.25% in “emergency” interest rate cuts halted the decline. The rate of growth in “credit” for housing “Investors” was, until early 2004, far in excess of that for “Owner-occupiers”, with the notable exception of the early 2000′s global recession that only briefly affected Australia. At that time, “credit” growth for “Investor” housing plummeted to the same level as the “Owner-occupier” rate, before recovering spectacularly to reach a whopping 30.7% annual growth in Feb 2004. We see a similar, though far smaller effect largely repeated in the post-GFC period. The Rudd Government further doubled the First Home Owners Grant. A modest influx of new “First Home Owner” buyers rushing out with their government-debt-financed mortgage deposit to bid for a house, drew the “investors” back into the market as well. 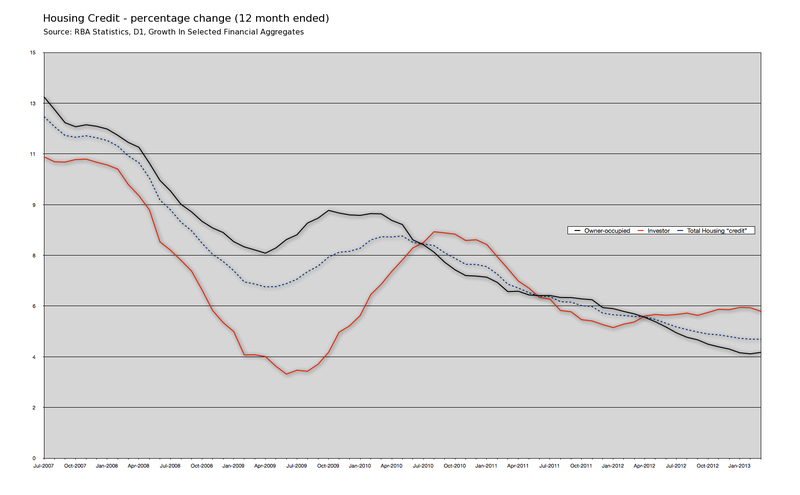 By July 2010 the “Investor” housing credit annual growth rate once again overtook that of “Owner-occupied” housing. As you can see from the chart, the annual growth rate in credit for “Investor” housing had already peaked in August 2010, and had begun to fall, 2-3 months before the RBA’s final 0.25% interest rate increase in November 2010. “Owner-occupied” housing credit growth, by contrast, had peaked back in October 2009 — the very same month in which the RBA first began to raise interest rates again, from their GFC “emergency low”. The First Home Owners Grant helped keep “Owner-occupied” housing credit growth relatively steady through to March 2010, when it resumed its long, steady post-2004 and pre-GFC decline. It has only now begun to flatline, in the first quarter of 2013. The important observation to make about this chart, is that since the GFC “peak fear” in late 2008 and early 2009, things have changed. The world has gone past a point of no return, and the old “rules” of monetary and economic policy do not necessarily apply anymore. The RBA now has the official interest rate at 2.75%. 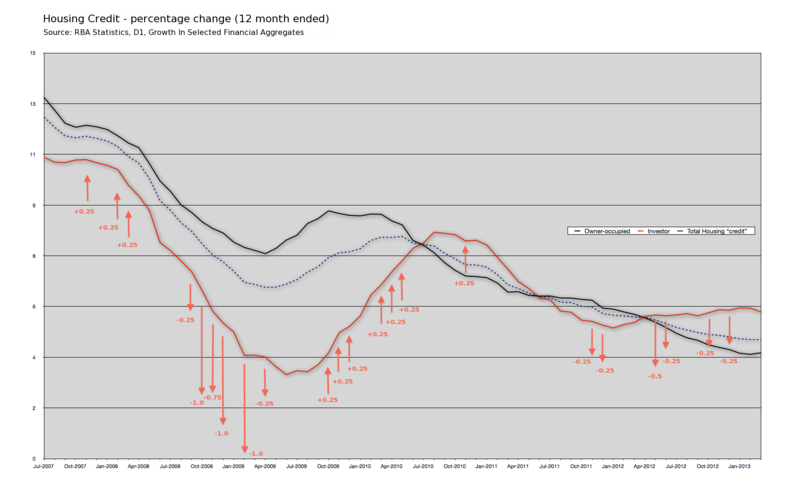 They have cut a full 1.5% since November 2011, without managing to “stimulate” a “recovery” in the growth rate of house prices housing debt. There are many more knowledgeable observers than I who have argued that 2% is as low as the Australian official interest rate can go; that 2% is effectively ZIRP (Zero Interest Rate Policy) for us. The reason given sounds plausible enough; the Australian economy is essentially financed by borrowing “capital” from abroad, so with the rest of the West operating on ZIRP, we need a +2% interest rate difference in order to have any hope of continuing to attract foreign “capital”. If the RBA is indeed “lower bound” by the 2% level, then the above chart makes one thing pretty clear. At the present 2.75% cash rate, even another 0.75% in possible interest rate cuts is unlikely to “stimulate” much if any additional growth in Housing credit. 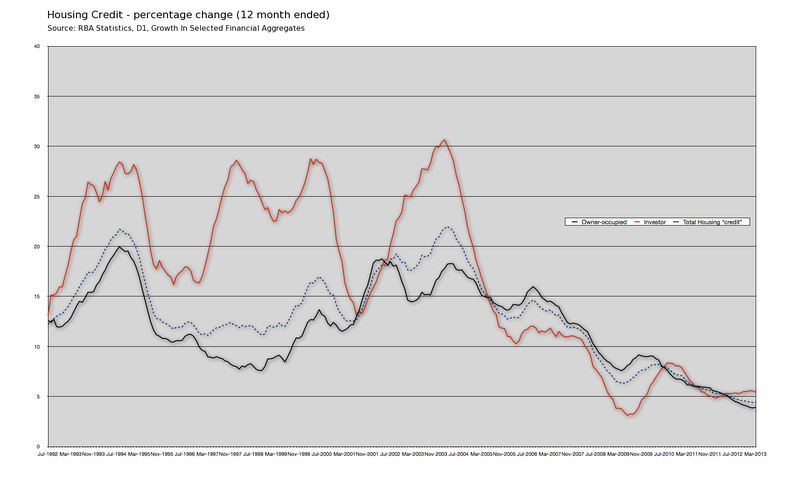 And with annual housing credit growth now running five (5) times lower than the February 2004 peak, and barely two-thirds the level when interest rates hit the 3% “emergency low” in April 2009, the RBA’s policy of trying to re-stimulate the housing bubble to support the economy after the mining boom … is doomed. This is the crux of the “pushing on a string” metaphor – that money cannot be pushed from the central bank to borrowers if they do not wish to borrow. The other financial point is that the ability to service the loan has also reached its limit. Using a median household income of $95k, 10% deposit, 38% before tax repayment limit and a 30 year loan period, the median house price should be no more than about $550k. I would suggest most states (and especially NSW) have reached this limit.